No, those are not pans and vegetables in the background at all. 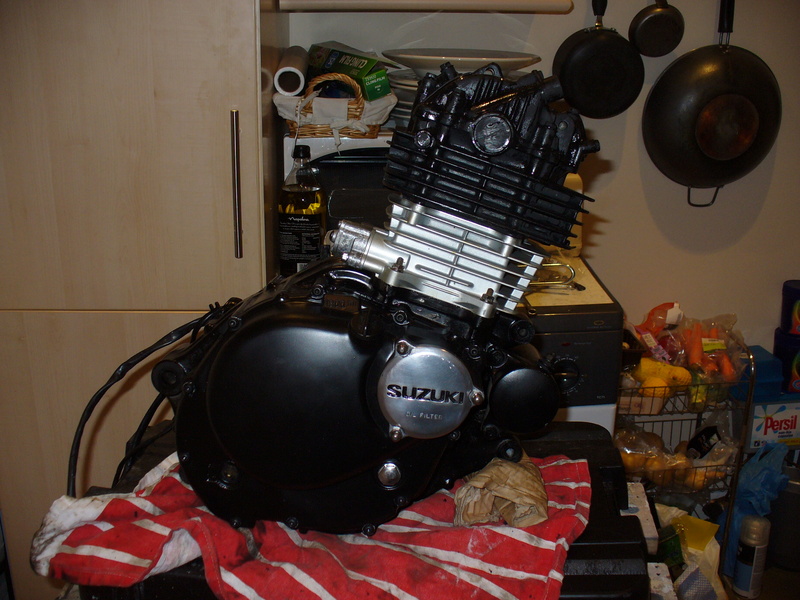 I would never dream of rebuilding an engine in the kitchen while my girlfriend was visiting her father. The first engine task (whilst waiting for the shiny new barrel and piston to arrive from China) was procuring a cylinder head. One would think it would be a simple matter, but they’re clearly kept on the same shelf as the hens teeth and the rocking horse poo. I’m guessing, by the lack of heads and the number of short engines available, that the head must be the weak point. I do know that they tend to break camshafts if you run them without oil. Eventually I found one from an LT 250 quad bike, which everything on the web says is exactly the same. Of course it isn’t. The head casting is the same, the LT however has no tacho. 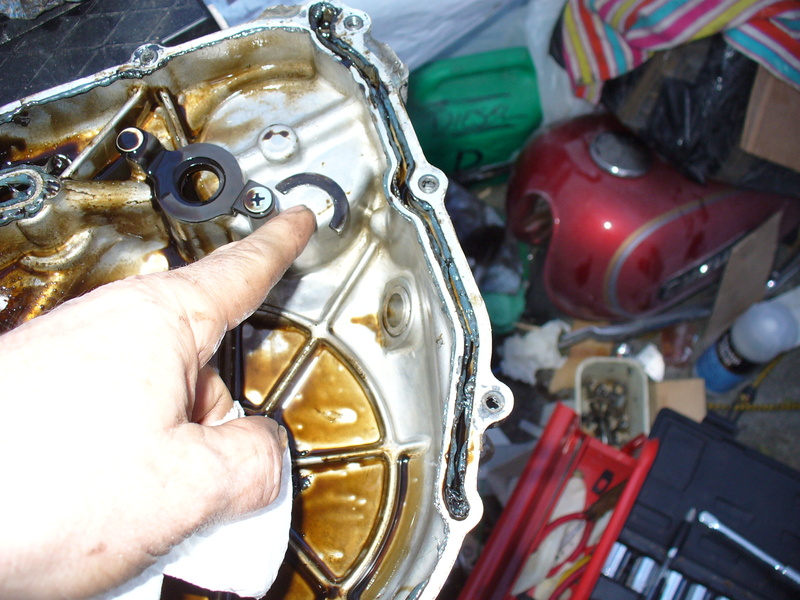 This means that the tacho drive gear on the camshaft is missing, as is the hole in the rocker box for the flexi drive. What’s more, there is an extra hole in the rocker box for the decompressor, which the GN doesn’t have. The solution looked simple enough. I could use the GN rocker box, and get hold of a cheap electronic tacho. The principle was fine and would have worked a treat if not for the BIG mistake. More on that later. In the meantime a quick decoke using cheap paint stripper (plug up the holes, fill the ports with it and let it soak for an hour then flush it out. What it doesn’t remove it softens up well) lap the valves in and it was ready to receive a quick coat of Ger Ger Granvilles cylinder black and be bolted on. It turned out to be a significant stroke of luck that I decided to paint the engine casings too. When I removed the primary drive casing I found this rather substantial bit of steel (which should have been under the camshaft) floating about in it. That would have made a really interesting noise. I did see one warning on the web to carefully check the size of the barrel locating pins when fitting the Chinese 300cc barrel. Apparently they need to be at least 12.1mm or the barrel misaligns itself and gets sick. Mine were fine and assembly was very straightforward, except for the extreme shock at the price of Moly paste. The only other engine(ish) mod was the fitting of an engine sprocket that was one tooth larger. I really hated running the little thing so close to the red line and I’d read that they could cope with higher gearing, which seemed entirely reasonable since first gear was only good for about the first five feet anyway.